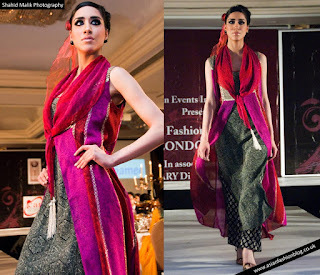 The Pakistan Fashion Extravaganza took place at the Jumeirah Carlton Tower Hotel in London on the 18th April 2009. 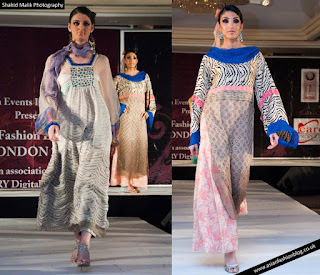 There were a range of Pakistani designers showing diverse collections. 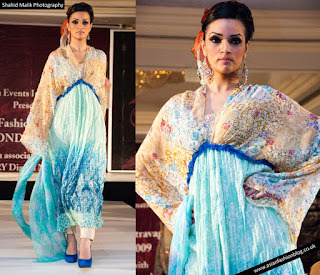 Let's start with the Faiza Samee collection. There were bright colours, and a lot of beautiful floaty fabrics. If you click on each image, for a larger view, you can see all the small details that go into each outfit to create interesting shapes and avoid the cloak/poncho look. Overall, I really liked this collection, I'm not sure I'd feel comfortable wearing the first 3 outfits in England, but stick me on a beach or in a warmer climate and I'd happily wear them out and about. Another thing that's great about these outfits is that that majoriry don't show too much skin, making them ideal for the ladies out there who want to look fashionable and feel beautiful without showing off their arms and legs. Many thanks to Shahid Malik for the photos. Pakistani outfits are so stylish, it makes the woman look so gorgeous and elegant. the colors are so fabulous!